Nanovor are tiny silicon monsters that live inside your PC and everywhere. 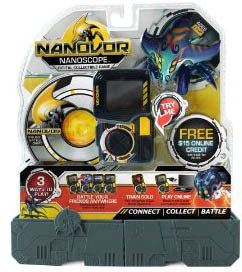 Connect online and then unlock the offline world of Nanovor with the Nanoscope. Play with up to four Nanoscope devices and connect your Nanoscope to your PC. Challenge your friends where ever you are. Play Mini-Games exclusively on the Nanoscope to make you Nanovor more powerful. Share your Nanovor collection between your Nanoscope and PC. Create Teams with combo moves that your friends can't beat. Collect Over 100 Nanovor monsters - more are discovered almost every day. Trade with your friends online.